Booksellers Without Borders: July Book Club: Happy Birthday, Harry! Since our book club meeting was fairly close to Harry Potter's birthday we decided to dress up, bring some magical food, and dip into a little Hogwarts fan-fiction for July. This is going to be a little different from our normal book club posts so get ready for some pictures! But first things first - The book we chose was James Potter and the Hall of Elders Crossing by G. Norman Lippert. This is the first in a 4 book (so far) series of fan-fiction about Harry's oldest son. We all agreed that it was well-written and evoked that wonderful sense of the magical world that we'd been missing since the last Harry Potter book was released. And this is no short story fan-fiction either. We're talking 400 wonderful pages of Hogwarts, James, his friends, and enemies. And, the best part is they're free. If you want to read it yourself check out the James Potter Series Website. Oh - and in case you're wondering? He actually got permission from J.K. Rowling to distribute these. True story. James Potter is off to his first year at Hogwarts and the thing he's most worried about is living up to his famous father's reputation. What if he's not a Gryffindor? What if he doesn't make the Quidditch team? What if he can't handle the class work? But as the school year begins James discovers he has much larger problems to deal with. First there's the new group of people who don't believe Harry was as big a hero as everyone has claimed and that he's in league with the Ministry to cover up the truth about who Voldemort really was. Then there are the visiting teachers from the American school of magic. While it might be exciting to meet Benjamin Franklyn, a few of the teachers seem to be hiding something - and it doesn't look good. James and his two best friends find themselves tangled up in all of the intrigue and James has to figure out how to forge his own path - and still manage to pass his classes. So go download, read, enjoy! Now for the pictures! Yeah! was the easiest we found. It's so much fun being book friends! 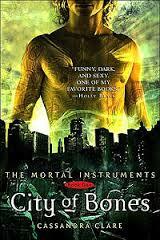 And for August we decided to dive into City of Bones by Cassandra Clare because the movie came out in August too. See you soon with our August book club reviews! Labels: Book Club, Harry Potter, James Potter, Rebecca T.